Loves Rubberstamps Blog: Sensational Sunday Blog Hop + CANDY! Hope that you are enjoying your weekend! Before I share my project ( and YES! I had a little time to get crafty - YAY!) We have to announce last week's winner! Please send me an email at lovesrubberstamps@yahoo.com by July 6th and I will send you your code for a $10.00 gift voucher to the Loves Rubberstamps store! Welcome to the Loves Rubberstamps weekly Sensational Sunday Blog Hop! The Design Team has created some gorgeous projects for your Inspiration. Check out each link and leave a comment. If you get lost along the way, each stop will have a full list of links. One of the Design Team posts is the hop's Sensational Sunday Sweet Spot and a name will be drawn from that list of comments to win a $10 Loves Rubberstamps Gift Voucher! Remember, you have til 8:00 pm CST Saturday to leave your comments! LOL - What do you think? Think I am dreading going back to night shifts or what - LOL! 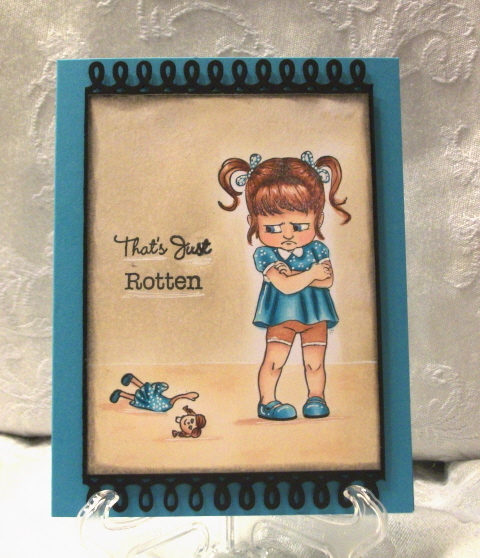 This adorable stamp is called Lucy's Broken Dolly and is from Make It Crafty. 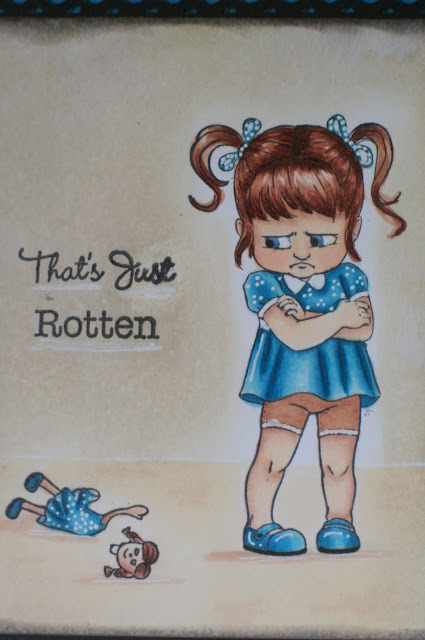 I colored her up with copics and used Tim Holtz Distress Inks - Antique Linen, Old Paper & Pumice Stone - to sponge around my little scene on the top and used markers to make the floor. I wanted to keep the card pretty simple so I just mounted my little scene on a piece of black cardstock. I punched the edges with a Martha Stewart loopy border punch. Now be sure to check out what the other Designers have for you today! Don't forget to leave comments on all the blogs for the most chances to win! Enjoy your Sunday and thanks for stopping by! This is fabulous! Love the CAS style with this. Oh I love this!! reminds me of my DD, face and all! :Z lol. Omgoodness, she is just TOO CUTE!! What a darling face and stunning coloring! As mommy to 4, I confess I've seen this face a few times, LOL! This is so adorable, I love it! And yes, I can definetly see your dred and don't blame you! So sorry you have to go back to night shift. Never fun. I have to go spend a week with Jason's family... the ones I don't really care for... and I just found out they are bringing their nephews. So 10 people or more under a small 3 bedroom 1 bath cabin in the middle of nowhere with no internet or cell reception. I am going to lose my mind! Hopefully you can switch back to dayshift again soon! By the way really cute card! Thirds are rotten, I am sorry you have to go back to them. This card is just adorable! I have this stamp, but haven't gotten the chance to use it. I might have to dig it out now! Have a great week! Glad you could find some time to play. Love what you came up with. Super cute. I find the look at this girl's face so much more funny than I did when I'd see it on my own daughter's face at 3 - LOL. A fabulous card. Thanks for the smile and thanks for joining us this week at ATS&M. What a gorgeous creation! Thank you so much for sharing with us at Stampin for the Weekend this challenge!